The ending of Penumbra: Black Plague, and the events leading up to it, confirm some of the speculation in my last post about the role of the virus in ancient times — at least, if you trust the central virus hive mind, which can’t be completely objective on the matter. (Yes, it’s another story about a misunderstood alien hive mind. The more I play of Penumbra, the more I notice ideas from other games I’ve played recently, including ones written later. It’s as if the attempt at so many formal genres at once has turned it into a kind of cliché nexus.) It claims that it was once benevolent, but has been fighting for its life ever since the Archaic (the secret organization that built the laboratories) decided that it was a disease and had to be cured. Ah, but what about the zombies? Just infected individuals sent out to patrol the outer reaches; their zombie-like behavior is a consequence of being too far separated from the core to participate in the hive intelligence properly. Clarence, now. He’s a different kettle of fish. “Clarence” is the name that the player character’s infection gives to himself, sardonically choosing it after inspecting your memory of It’s a Wonderful Life. A complaining bully with an Oscar-the-Grouch accent, he’s both individually smart and unambiguously malevolent, even if he does sometimes help you survive. Furthermore, he has an unnerving amount of power over your mind. He can occasionally take control of your senses, make you see things the way he wants you to see them — for example, eliminating doors that he doesn’t want you to go through, giving an excuse for Silent Hill-style variable geography. He can even erase your memories to make more room for himself. There’s one bit where Clarence implies that you didn’t actually kill Red in the first game, but that your memory of doing so is just him messing with your head for lulz. He could be lying about that, of course. He lies a lot. I’ve talked before about how annoying the “disembodied sidekick” in an adventure game can be even when the authors don’t intend it that way, but in this game, they just ran with it. In one scene in a library, Clarence repeatedly gives obvious hints that there’s a secret passage behind one of the bookshelves. It takes a while to find the fake book that triggers it, and while you’re looking, Clarence repeatedly berates the player’s intelligence. In most other games, this would be a bad thing, but here, it serves the authors’ purpose, which is, to make you hate Clarence even more. When you eventually find a way to cure the virus, Clarence does everything he can to try to stop you, including, in the end, simply pleading for his life. (Strange behavior for a disease!) And despite everything he’s done to you, the simple abjectness of his position provokes some pity. You are, after all, murdering a conscious being, but what choice do you have? You can’t trust him to leave you alone. It’s him or you. But having been infected once, you retain the ability to contact and be contacted by the hive mind, and thereby get the exposition I described back in the first paragraph. The hive mind isn’t like Clarence — it’s far more menacing. It doesn’t blame you for murder, because it too wanted Clarence dead. Not because he was evil, but because because he was too individual, too human. Fortunately, all it wants at this point is to be left alone, to have the outside world forget that it exists. But that isn’t going to happen. We still have one more game to go. 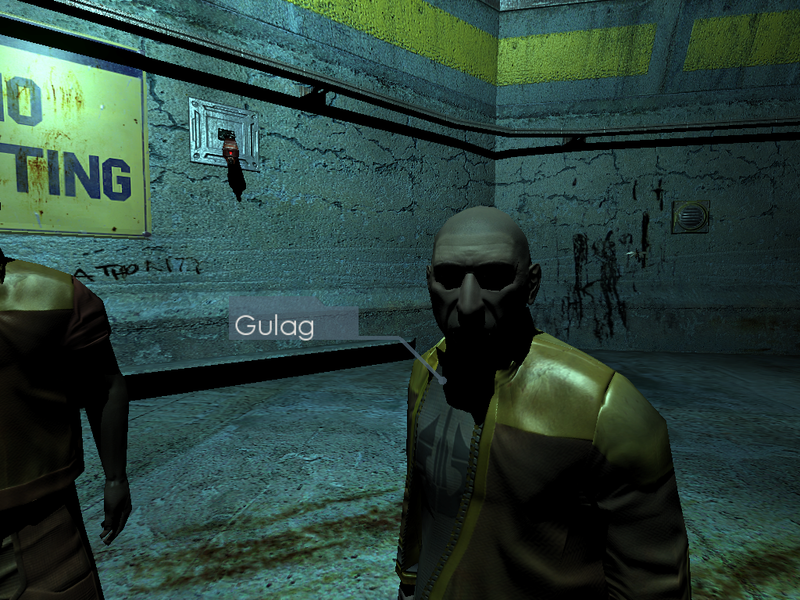 Black Plague, the second installment of the Penumbra trilogy, starts shortly after the first left off, with Philip, the player character, waking up in a cell in a secret research station hidden under the mines. I’m immediately struck by a number of surface similarities to Half-Life: ruined-laboratory look, mutated zombie-like monsters, booby-traps made of explosives wired to laser tripwires across hallways. 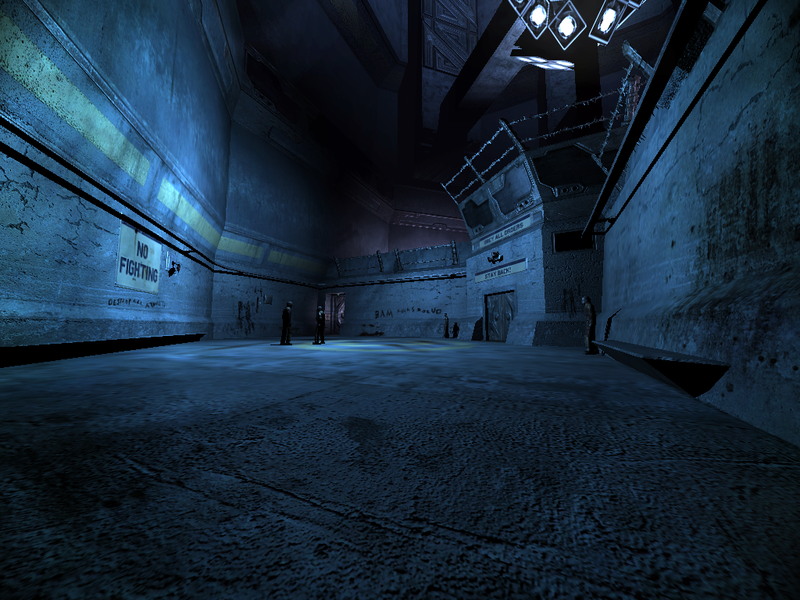 It’s a pretty big contrast to Penumbra: Overture in style, but the gameplay hasn’t changed much — if anything, it’s this episode plays less like Half-Life than its predecessor, as I haven’t found anything that can be used as a weapon, except perhaps some bricks I could throw. Presumably the creators got complaints about the awkwardness of melee in Overture and decided to just eliminate it. This means that stealth is even more paramount, especially since some of those zombies have flashlights. They’re pretty smart for zombies, really, capable of speaking in coherent sentences and everything. “Zombie” is probably the wrong word. Call them “infected” if you like, because documents in the game are pretty clear that we’re dealing with an alien virus here. One that takes over your mind, or, at first, just produces a second mind, which the infected hear as a voice in their head. Red, the madman in the previous episode, wasn’t just insane from isolation, he was infected and knew it. And now Philip is too. There’s a point where you find documents describing the early symptoms of the virus, such as auditory hallucinations and déjà vu, and realize that you’ve already experienced most of them. Shortly afterward, you get a full-fledged voice in your head telling you what to do, taking over Red’s previous role as disembodied sidekick, but more antagonistic. The interesting thing here is that it seems like the virus-personality might not be necessarily evil. It might, in your case at least, be more of a symbiosis than a disease. It’s certainly capable of being helpful, and there’s been mention made of the virus helping its host to survive (or, as in Red’s case, forcing its host to survive). To a large extent, Philip’s new brain-buddy is as new to this whole situation as Philip is; its whole personality seems to be formed from reading his memories, which means that its notion of what it is and what it should be doing is informed by its host’s expectations. The whole phenomenon is linked somehow to pre-Columbian Inuit superstitions and practices that were abandoned as demonic with the conversion to Christianity (as described in a document in the previous game — this story is starting to pull together elements that didn’t seem connected before). When the infection takes hold, you have a series of nightmarish interactive visions/hallucinations/ordeals involving elements of ritual sacrifice and elements of events in the previous game (with Red’s death qualifying as both). Until you reach the end and come back to the real world, the game basically stops feeling like Half-Life and instead feels like Silent Hill. This whole bit seems like a kind of initiatory passage through the Abyss, and I can easily imagine ancient shamans, who hadn’t yet been told that the spirits are evil, deliberately becoming infected/possessed to share their wisdom. But then again, zombies. If the infection is supposed to be benevolent, something has clearly gone wrong. If I understand right, the virus has basically killed the original personality in these cases, and, in the process, left itself stunted. But perhaps it did this in self-defense. Penumbra: Overture ends inconclusively, which I suppose is its right, as the start of a series. There are certainly loathsome things in the depths — there are a couple of harrowing chase scenes involving gigantic annelids that remind me of D&D‘s Purple Worms — but the one character who talks to you is convinced that there’s something worse beyond the sealed door at the game’s very end. About that one NPC: He calls himself “Red”, and you never meet him directly; the closest you ever get to him is the other side of an unopenable door. He communicates with you by radio (don’t ask me how that works in a mine). He’s been trapped in the mine for a long time, and has gone quite mad, and talks very oddly 1At one point he says “There is much that should leave my throat box now, but words elude me”, which immediately made me think of “My blood pumper is wronged!” and is apparently a cannibal as well, if his stilted rantings are to be believed. But he talks as if he expects you to come meet him (despite the obvious danger), and his messages provide you with cryptic guidance through most of the game. And in the end, you kill him. Or he uses you to kill himself — he admits that he really guided you to him for that specific purpose, because the entities that share his head won’t let him do the deed himself. He’s locked himself in an incinerator, along with a key you need to open that final door, the one he desperately wants to remain closed. And it’s a peculiar moment, one of those uncomfortable places where you hesitate to go where the game is leading you. The floor of the room is littered with crude planking crosses — one of the writeups at Gamefaqs sees this as evidence that Red is a vampire, but that interpretation strikes me as bizarre and out-of-place; more likely it’s intended as a somewhat confusing comparison of Christ’s self-sacrifice to Red’s suicide-by-proxy, implicitly casting the player in the role of Judas. There’s definitely a sense of agency about turning the furnace on — you can choose to just poke around avoiding the issue for long as you want, but the consequence of not doing it is that you can’t finish the game and get stuck there forever in the bottom of the mine, just like Red, which presumably means you have a lifetime of eating rats and losing your mind to look forward to. So I make the unpleasant choice. There’s one more slight detour before you can get through that final game-ending door, and that’s going into Red’s living quarters. You get to see how this unfortunate man lived, and the things he surrounded himself with, and suddenly the dominant emotion isn’t fear but sadness. A letter reveals that he’s been trapped for 30 years, since the age of 14. And that, for me, is the emotional climax of the game. Actually going through the forbidden door and getting jumped in the dark by persons unknown is denouement. And that’s probably where I’ll leave it for a while. Near the end, I started having those graphics card issues I’ve been having lately. Taking the system apart and blowing the dust out seems like it might have helped me get through the ending, but I want to do a fuller investigation before I start any more graphically-intensive titles. When I lived within easy walking distance of a good art theatre, I used to go to a lot of movies that I had never heard of. There was something enjoyable about coming into the experience with no expectations beyond the title. It was in something of this spirit that I bought the Penumbra series when Steam put it on sale a few months ago. 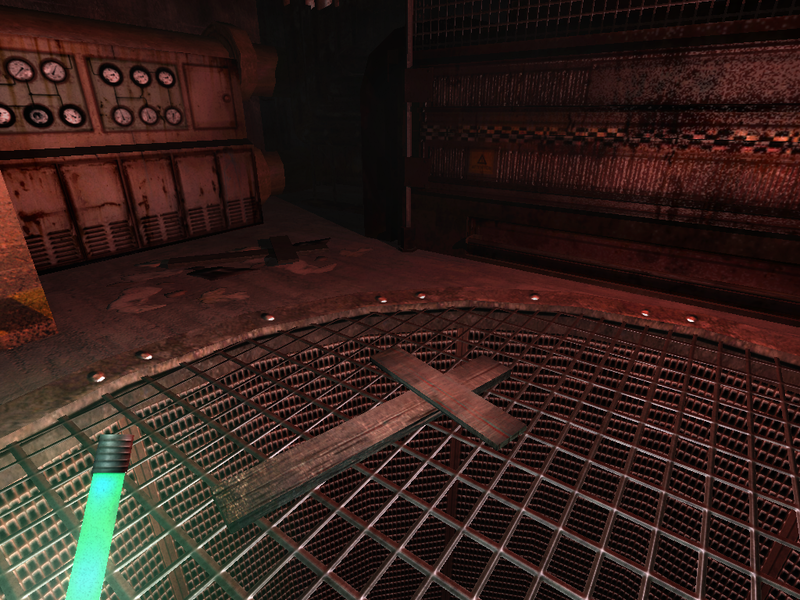 They were billed as horror adventure games, and seemed to have gotten pretty good reviews, and that’s about all I knew — and, since people who categorize games often have only a vague notion of what the adventure genre is 1For example, Steam also gives the Adventure designation to such titles as Earthworm Jim, Rayman Raving Rabbids, and Terminator: Salvation. , even that much was uncertain. From the title, I vaguely expected something sci-fi — “penumbra” connotes eclipses to me, which suggests a plot involving orbital mechanics, but I suppose to another person it would connote constitutional law, and that person would be as wrong as me. The setting of the first game is an abandoned mine in the cold wastes of northern Greenland, where the people apparently dug too greedily and too deep, and awoke something ancient and terrible in the darkness, as tends to happen in mines in games. 2I myself have used this premise multiple times when I needed a plot for a RPG session and couldn’t think of anything else. One time I even used it in Dogs in the Vineyard, which is a real stretch. It turns out to be a blend of adventure, survival horror, and stealth game, all done from a first-person perspective with the familiar FPS-style control scheme. (It was quite pleasant trying the standard keys and seeing that they all worked. Can I run? Yes! OK, can I crouch? Yes! Oh, man, I can even lean!) Stealth and horror are such a natural fit that it’s surprising that they’re not explicitly blended more often. After all, given the presence of a horrible monster, what’s more natural than hiding from it? One of my big complaints about the Resident Evil style of game is that fighting monsters and winning tends to weaken the sense of fear. And it had something of that effect here, once I realized that the most common monsters can actually be fought. (There are no guns, but a hammer or a pickaxe can be used as a melee weapon.) Still, fighting is extraordinarily risky, due in part to the awkwardness of the weapon-swinging interface, so stealth is your best bet most of the time. Monster dogs of some sort (rabid? demonic? zombie?) prowl the mines; if you crouch in the darkness without moving for a second or so, your view stretches out and turns blue, simultaneously signaling that you’re safe from canine eyes and putting an unnatural cast to the experience. The best part is that hiding makes the player character anxious: if you look directly at a dog, you start to shake and can give away your location. This is a brilliant touch. Scary stuff is often scariest when merely glimpsed, and here the player is given a game-mechanical motivation to choose mere glimpsing. 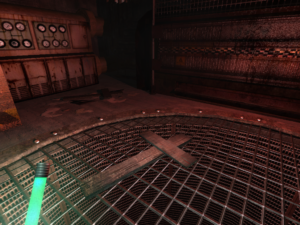 The monster-avoidance parts have a certain amount of adventure-game-like content, but not more than is typical for a survival horror. 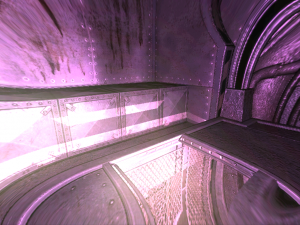 It’s in the isolated safe places that the adventure content really comes to the fore and the game turns into a self-contained puzzle scenario. It’s also in these sections that the game seems least like a horror story. It’s all about repairing machinery and improvising explosives and other such hard-headed masculine activities. Much of it is physics-based, too, with things you can stack on top of each other or throw onto ledges or whatever. Inventory items are typically applied in point-and-click fashion, but most items don’t go into your inventory at all, and instead have to be dragged around with the mouse cursor. Sometimes this can be difficult; I’ve had a terrible time trying to turn valve handles this way. Still, I find it satisfying to see adventure content in a full-freedom-of-movement first-person system, a combination that hasn’t been done enough for my liking. 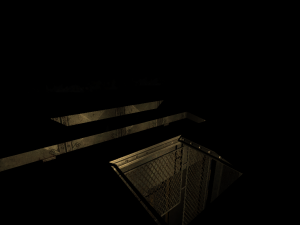 The overall structure so far seems to be a linear sequence of hub areas made of dog-infested corridors, each of which has several adventure-game rooms on its periphery. Backtracking is made impossible by frequent cave-ins. I could make sarcastic comments about that, but I actually think the cave-ins are presented really well. Especially the cloud of dust that they raise. I can practically smell the dust clouds in this game. 1. ↑ For example, Steam also gives the Adventure designation to such titles as Earthworm Jim, Rayman Raving Rabbids, and Terminator: Salvation. 2. ↑ I myself have used this premise multiple times when I needed a plot for a RPG session and couldn’t think of anything else. One time I even used it in Dogs in the Vineyard, which is a real stretch. The point I was stuck on turned out to be decidedly lame: the only way to catch the assassin is to actually be attacked by him, and this only happens in one location, at night, if you enter from the right direction. I suppose the designers were thinking that players would naturally walk through that area on the way home from questioning people at the bar, but why walk when you can teleport? This is an example of a problem that plagues Sierra games in general: the problem of plot advancement depending on player actions that the player has no motivation to perform. And in fact it’s a fairly mild example, because once the assassin appeared, it was pretty clear what the trigger was. 1An example from another game that doesn’t share this property: In King’s Quest IV, visiting the wicked queen’s castle makes a whale appear in the ocean. You’re likely to trigger this once, because your initial exploration will include the castle, but if you restart the game, you’re likely to avoid the castle, because you’ve learned that there’s a limit to how many times you can visit it safely. And then you’ll be confused about the whale’s absence, because you weren’t aware of doing anything special to make it appear the first time. Mild enough, anyway, for me to get through it. Having gotten unstuck, I finished the game with all three base classes. (I haven’t even tried the Paladin yet. I may do so in the future, but even so, the game is now officially off the Stack.) And in all three, I had the full 1000 points. This didn’t work out quite like I expected: unlike earlier games in the series, the maximum score isn’t the total quantity of available points, but rather, the largest score allowed. You can keep racking up more Deeds in the endgame, each accompanied by the score-goes-up noise, but the displayed score never goes above 1000. Once I realized this, in my first endgame experience, I didn’t bother hunting down obscure points with the other characters, and was free to choose whatever wife I felt was appropriate for each of them, regardless of point value. 2In fact, it turns out that you can’t always choose Erana or Katrina. Neither of them is willing to mary a Thief. The first class I finished with was the Wizard. This is because the Wizard is the game’s easiest class. Not the simplest, mind you — that would be the Fighter. The Wizard is much more complex than the fighter. Figuring out the Wizard’s strengths is more difficult, because there are so many more possibilities to try. But once you have a handle on them, you can just exploit them for all they’re worth, and that makes the game easy. Where the Fighter battles his way through Minos’ fortress — a risky, time-consuming process — and the Thief sneaks his way in — also time-consuming and risky, even if the risks are different — the Wizard can pretty much get away with casting Calm and sauntering through. That’s power, man: the ability to walk through a batlefield unmolested. And if you decide you like killing things, like I’ve said, the Wizard is overpowered there too. 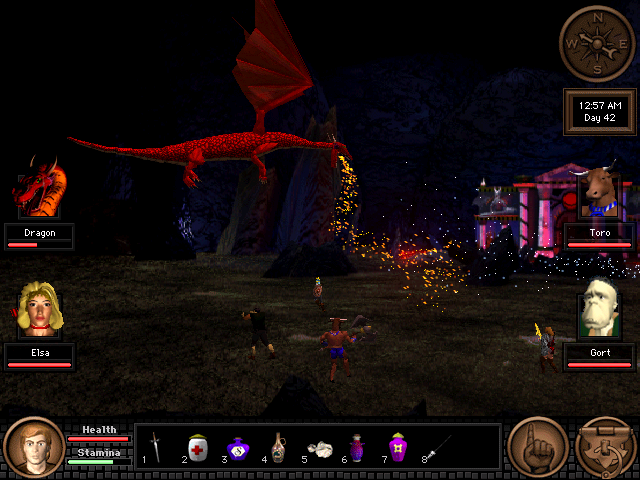 In the end, you’re joined by several NPCs who fight the dragon alongside you — and, despite my earlier doubts, it is a real battle fought in the game’s regular combat engine — but I can easily see the Wizard trouncing the dragon solo. But while the Wizard is the easiest, and the quickest to play if you don’t restrain yourself, I think the Thief is the most engaging class this time round. 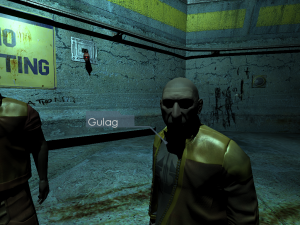 It has a lot to do with the adoption of (simplified) stealth mechanics from other games: QfG5 was released the same year as Thief: The Dark Project and Metal Gear Solid, so it gives you a blackjack and a couple of fortresses full of guards patrolling in regular cycles or conveniently looking in the wrong direction. In previous QfG games, stealth was basically a matter of skill checks to see if people heard you plus a certain amount of special-cased hiding scenarios, not general line-of-sight stuff. Also, you get to sneak around on rooftops. I was always disappointed with the fact that QfG2 — the one in the “Arabian Nights” setting, which suggests Thief of Baghdad hijinks to me — didn’t have any satisfying rooftop escapades, but instead basically just repeated the kind of housebreaking you did in QfG1. So I’m pleased to see some of that here, even if it’s rather small. My one complaint about the Thief is actually a pretty large one. The Thief can’t always avoid combat. There are several mandatory fights, essentially boss fights that follow a bout of sneaking, and the Thief isn’t very good at them. Traditionally, the Thief’s combat method in the QfG series is to stand at a distance and throw knives, running away if necessary. But I found this unworkable in the new combat UI, so I wound up playing the mandatory combat basically like a less-powerful Fighter. Unfortunately, one of those encounters is with the dragon at the end. I mainly played support on that one in my Thief game, performing functions such as handing out equipment and convincing Gort to sacrifice himself. I had some trouble at first with the game crashing in or immediately after the final battle — consistently enough that I almost gave up before seeing the congratulations sequence. Either rebooting or playing from a different save helped, I’m not sure which. Anyway, it was anticlimactic. They obviously spent their cutscene budget on FMV scenes of the dragon. After it’s dead, you just have the player and a bunch of NPCs gathered in the throne room talking. You get to choose whether you want to actually be king or not 3If you choose not to become king, Elsa is chosen instead. So if you’re engaged to her at that point, you get to still live in a palace and everything without the duties of rulership., and your engagement (if any) is announced, and that’s it, unless you’re playing a Thief, in which case you can get an additional scene in the Thieves’ Guild where you’re proclaimed Chief Thief. If you choose to become king, you don’t even get a crown, or at least not where the player can see it. I want my crown! Sir Graham got a crown when he became king of Daventry. He had to pick it off his predecessor’s corpse himself, but it was a crown. 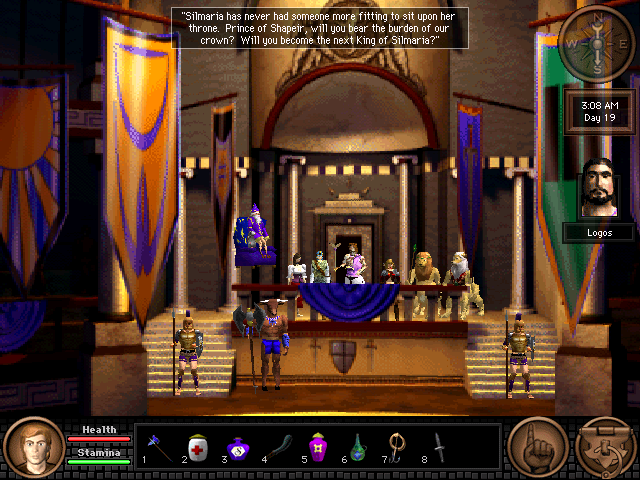 But then, all of the endings in the series were disappointments compared to the impact of the ending scene of the original QfG1: the celebration, the reiteration of prophetic verses that you understand now (with no mundane dialogue to spoil it; we’re in storytelling mode now), then the music transitions to the gentle Erana’s Peace theme while the credits roll over the hero and his new friends floating lazily on a magic carpet over the valley where the game took place — your first view of the valley as a whole! This is what you were saving, kids! And finally, the barest hint of what was to come in the forthcoming sequel. If there’s one element of this that I think would improve the ending to QfG5, it’s the shifting away from NPC dialogue to narrator voice. That’s what we really need at the end of an epic: something along the lines of “And so King Baf ruled wisely, and lived to an old age” or whatever. I’ve spent a lot of time on this game now. Probably more than it deserves. I don’t try for perfect scores on every game I play, let alone perfect scores with every character class. I’m quite happy with my “43% complete” in GTA3. But I have some sentimental attachment to the QfG series. And as such, I don’t even feel qualified to say if anyone who doesn’t have my attachment to it should play it at all. It has its ups and downs (and silly clowns). I’ve been complaining about the bugs and gameplay issues a lot, but if nothing else, it has some really good music, always one of the high points of the series. Next post: Something new. 4New to this blog, anyway. 1. ↑ An example from another game that doesn’t share this property: In King’s Quest IV, visiting the wicked queen’s castle makes a whale appear in the ocean. You’re likely to trigger this once, because your initial exploration will include the castle, but if you restart the game, you’re likely to avoid the castle, because you’ve learned that there’s a limit to how many times you can visit it safely. And then you’ll be confused about the whale’s absence, because you weren’t aware of doing anything special to make it appear the first time. 2. ↑ In fact, it turns out that you can’t always choose Erana or Katrina. Neither of them is willing to mary a Thief. 3. ↑ If you choose not to become king, Elsa is chosen instead. So if you’re engaged to her at that point, you get to still live in a palace and everything without the duties of rulership. 4. ↑ New to this blog, anyway. 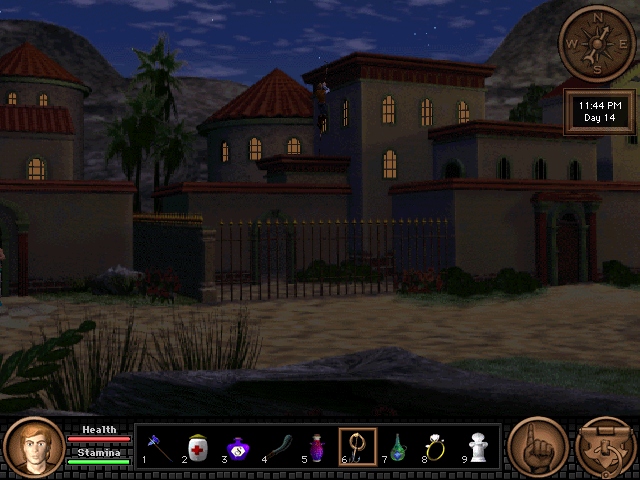 I’ve made a certain amount of progress with my new Thief character in Quest for Glory V. I haven’t yet started the Rite of Rulership, but I’ve joined the Thieves’ Guild, practiced my skills there, stocked up on equipment, and done a little housebreaking. Additional opportunities to be a jerk. My favorite example of the Thief being a jerk occurs in QfG3. There’s a musician in the open-air marketplace of the city where the game starts, with a bowl set out for coins from passers-by. Any character class can put a coin in the bowl, and earn a few points in the process. But the Thief has the option of stealing coins from the bowl instead, pretending to put a coin in to cover his movements. You get the same number of points for this. Now, in that example, the consequences of being true to your profession are that you have slightly more cash, somewhat less Honor (making it basically impossible to become a Paladin), and the same score as you would otherwise. But other acts of theft in the games tend to just give you points that you can’t earn without antisocial behavior. The score in an adventure game is a non-diegetic reward mechanism. It’s a way for the author to reward the player for doing things the way the author wants them done, even in cases where there’s no benefit to it within the game. In particular, the QfG games use it as a way of rewarding you for staying in character. I’ve commented before on how the Fighter in QfG5 gets points for winning the Rites, while the Wizard does not. This tells me that the Fighter is more ambitious, more driven to win. The thing is, I haven’t really seen this happening in QfG5. I’ve stolen some petty valuables from an empty house, but didn’t earn points for it. The game provides even greater opportunities for antisocial behavior than the previous games, mainly by adding the Pickpocket skill to your repertoire. You can try to rob everyone you meet, if you’re so inclined. You can even steal things that people would gladly give you for free if you asked them. But I have yet to see my score go up for such an action. It’s seemed to me that the series toned down the crime over its run, which isn’t at all unusual for the morally questionable aspects of a series that’s supposed to be about a Hero. 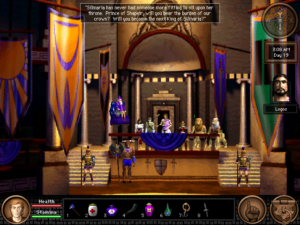 The Thieves’ Guild was a significant part of QfG1, a very minor part of QfG2, nonexistent in QfG3, and present but abandoned in QfG4. Opportunities for crime, while still present and rewarded in 1-4, lessened in number. In QfG5, we suddenly have a fully-functional Thieves’ Guild again, and there’s more opportunity for crime than ever before, but very little explicit motivation for it. Mind, this was a few years before GTA3 made it clear that crime for crime’s sake was viable in games. The original GTA had been released, though, so who knows, maybe there was some influence there. It’s July 4th, American Independence Day, and high time for me to finish my writeup on fighting the Patriots. All that remained after last session was two boss fights and a whole lot of exposition. The first boss fight was against a bunch of autonomous Metal Gears, part of the armada guarding Arsenal Gear, the mobile complex housing the Patriots’ computer system, which was advancing on New York City. Since these Metal Gears lack human drivers, I find it impossible to keep thinking of them as anthropomorphic tanks. They’re robots, pure and simple. They’re a variant of Metal Gear Ray, the model seen in chapter 1, which was designed specifically to fight other Metal Gears. This explains why they’re so bad against a single human opponent. The second fight was a sword duel against Solidus, who was by that point clearly the end boss. I should have picked up on this sooner: Solidus’ true goal was not to destroy the computer, but to seize control of Arsenal Gear for himself. This explains why his lackeys in Dead Cell were trying to stop me from completing their own stated aims. At the end, we find out that he didn’t want Arsenal for its own sake, but as a way to learn the identities of the Patriots: as he points out, part of its function is to find and destroy that information anywhere it exists, so it must have some record of what it’s supposed to destroy. Some more revelations happen after that, but to me, this is the point where the willing suspension of disbelief reaches its limit. According to Revolver Ocelot, who’s been working for the Patriots all along, Solidus, and everyone else, is just a dupe, acting out their roles in the S3 Program, a project to turn Raiden into a super-soldier like Solid Snake by subjecting him to a scenario similar in many details to the Shadow Moses incedent (the plot of Metal Gear Solid 1). Except that’s a lie too: according to the artificial intelligence program we know by the name “Colonel Campbell”, the real purpose of the S3 Program is social control, and by winning the game you’ve proved that it works. Or something like that. So in a way the Patriots win, but at the same time, you’ve fulfilled your “role” and are suddenly free, or as free as anyone else in the world, and Raiden and Solid Snake have a long talk about the meaning of freedom over a montage of New York street scenes. Perhaps the gradual loss of interactivity over the course of the game is supposed to be part of this theme, but I kind of doubt it. Then, after the credits show, we find out that the twelve people named as the leaders of the Patriots have all been dead for a hundred years. It’s clear by now that the writers are thinking of this more like an anime than a videogame — specifically, something like Evangelion or Lain that abandons the story in favor of philosophy at the end. I don’t know a lot about how the development of this project went, and can’t really say that there’s a cause-effect relationship here, but there were also some expected boss fights that just didn’t happen. One of the members of Dead Cell is a woman called Fortune who can’t be killed: bullets veer away from her, grenades become duds until she’s out of range. There’s an encounter with her earlier in the game, the sort where you can’t actually do anything effective and just have to avoid getting killed until the timer runs out and the scene ends. Structurally, it seems like a demonstration-of-power encounter, a way to establish her invulnerability so that you’ll be both more prepared and more emotionally engaged when you fight her again later. But that never happens: in the end, she gets killed in a cutscene by Revolver Ocelot, who you never get to fight either. Other impressions: First, it’s a very slick package. The controls, the music, the way the camera automatically swoops from overhead to horizontal views as appropriate: the production values are very high. Second, there are a lot of pin-up girly posters scattered around on walls and inside lockers, including product placement for FHM, clearly pandering to the core adolescent male audience. I suppose it’s realistic for a game involving soldiers, but they stick out somewhat as photographs in a rendered world. When you have a person who’s actually present standing next to a poster, it’s weird for the poster to look more real. Finally, there’s the matter of the dog tags. These are the game’s collectible items, used to unlock bonus items. But the process of getting them is fairly involved: you have to “stick up” a soldier by sneaking up behind him with a gun, then search him using the thermal goggles, apparently. This isn’t easily discoverable, and I didn’t read the part in the manual that explains it. My completism is itching, but although I certainly want to try to get some of them, I really don’t think I’ll try to get them all — apparently you have to replay the game on all of the difficulty settings to do so, and I don’t think I’ll be able to maintain that level of interest. It its, after all, primarily a story-game, and I’ve already seen the story. The fact that they put something like the dog tags in a game like this at all is a little strange, if you ask me, but it’s just a standard part of console games. You have to include something to give it “replay value”, even if it’s not something you’d really want to replay. Somehow, PC games have managed to avoid this — maybe because they’ve longer had the possibility of extending the game with add-ons and fan-made levels and other downloadable content. Are the newer consoles abandoning replay enhancers, now that they have the same content-downloading capability as PCs? I don’t know. If they aren’t yet, I expect they will eventually.